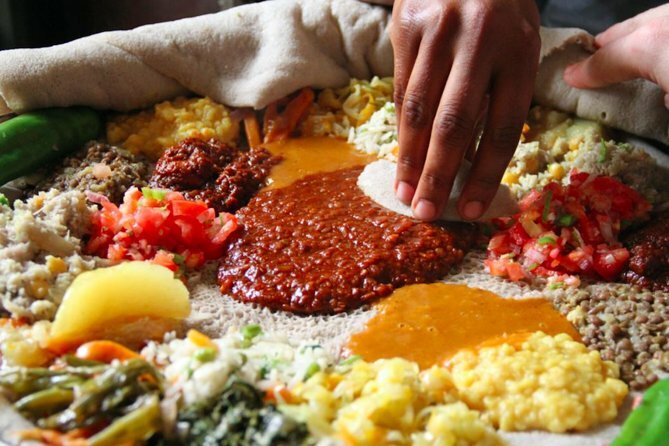 Join us for a walking Food Tour through one of Addis Ababa's neighborhoods where we will sample all kinds of Ethiopia's famous food! We will visit three restaurants, a juice house and coffee house sample vegetarian dishes, beef dishes and fresh fish. The tour starts at 4pm and ends around 8pm. The tour starts in the Addis Ababa's Atlas neighborhood with a welcome drink or coffee. From there we set off on foot to a family owned restaurant serving our favorite vegetarian dishes in the country. As we walk through the neighborhoods, our guides will share lots of information about Addis Ababa and the history and culture of the country. Next we visit Addis Ababa's most famous meat house followed by a fish restaurant. We'll refuel with some coffee and have a fresh juice for dessert! At every stop we'll try beers from different parts of the country. The tour ends around 8pm.